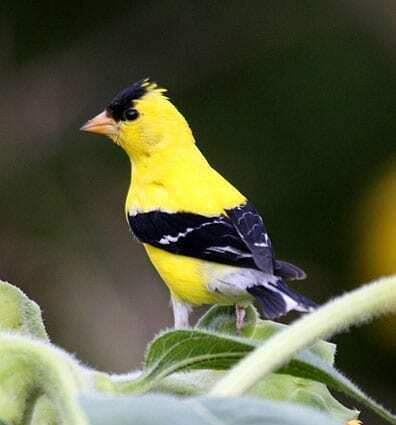 This handsome little finch, the state bird of New Jersey, Iowa, and Washington, is welcome and common at feeders, where it takes primarily sunflower and nyjer. Goldfinches often flock with Pine Siskins and Common Redpolls. Spring males are brilliant yellow and shiny black with a bit of white. Females and all winter birds are more dull but identifiable by their conical bill; pointed, notched tail; wingbars; and lack of streaking. During molts they look bizarrely patchy.